Bullying Prevention Month: The fact that October is both Disability Awareness month and Bullying Prevention month makes perfect sense when you look at the statistics for bullying of students with disabilities. Students with autism in particular are bullied at shocking rates: 63% of students with ASD reported being bullied at some point. 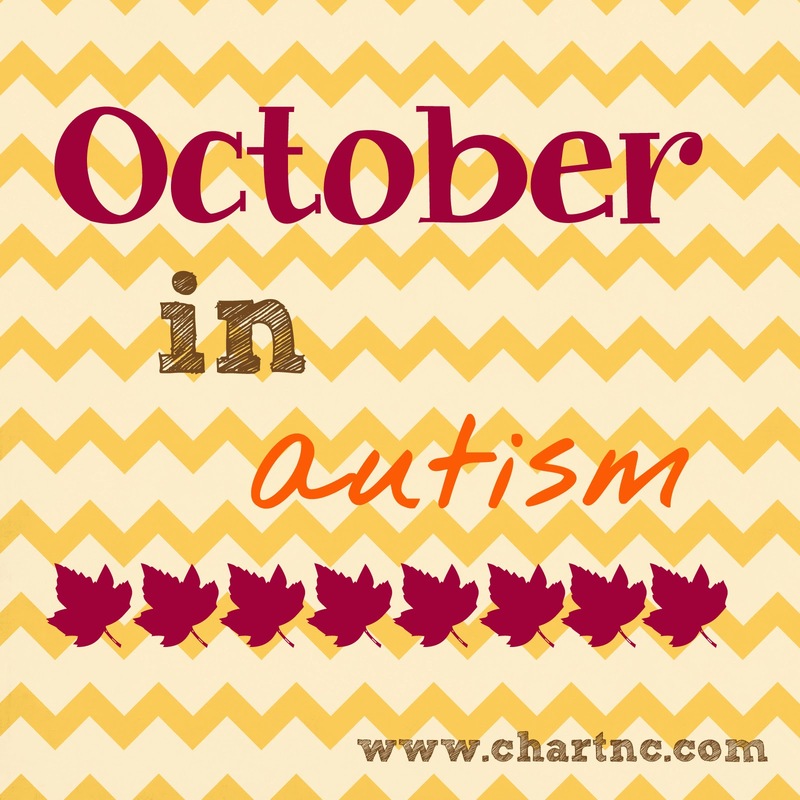 Read more about bullying and autism at the Autism Society of North Carolina to find out signs, causes, and actions to take. Pacer's National Bullying Prevention Center has a wealth of information for parents, students, and schools. 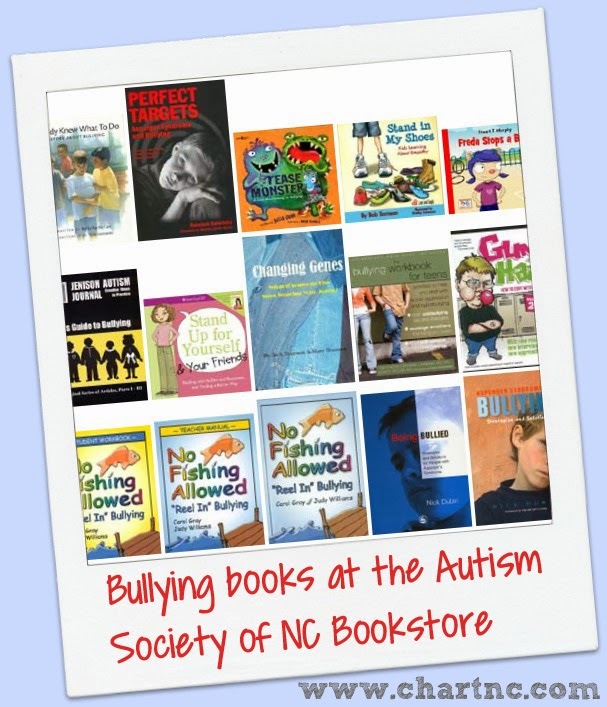 Also check out StopBullying.gov for bullying prevention ideas and visit the Autism Society of North Carolina Bookstore for numerous books and materials on the subject. 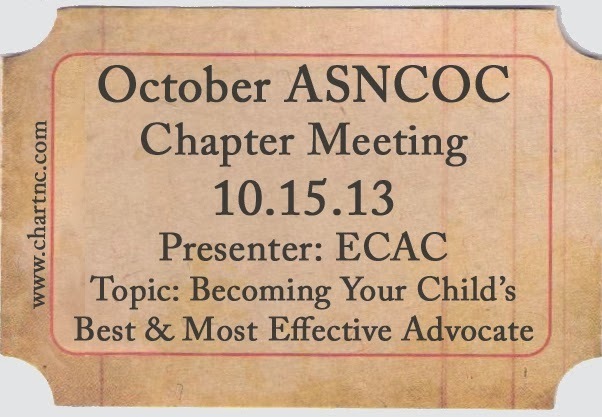 ASNCOC October Chapter Meeting: ECAC Presentation of Becoming Your Child's Best and Most Effective Advocate. This is an outstanding presentation covering special education law and IEPs, effective advocacy, communicating with schools and professionals, and much more. A must-see for all parents of children with any special need! See more details and registration information here. ASNCOC also has a great November meeting coming up, so check back for more information soon. TEACCH Mothers' Group: Meet monthly with other mothers to share stories of success and discuss strategies that have worked for your child with autism. Please note: group is open only to clients of the Chapel Hill TEACCH Center. Please R.s.v.p. to Catherine Jones: catherine_jones@med.unc.edu. Exceptional Children Parent Night: Chapel Hill-Carrboro City Schools invites parents of students with IEPs or 504 Plans to attend this educational evening. There will be several break out sessions from which to choose. CoTeaching: What is it and how can it impact my child's classroom experience and academic success? ASNC Durham County Chapter Meeting: Overview of Sensory Processing Issues and Strategies to Help, presented by Linda King-Thomas, Director of Developmental Therapy Associates. Refreshments provided; childcare is not available for this meeting. Visit the ASNC Durham Chapter's website for more information. 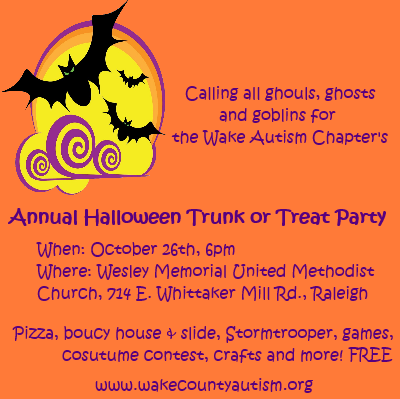 ASNC Wake County Chapter Halloween Party: Calling all ghouls, goblins, and ghosts to ASNC Wake County Chapter's annual "Trunk or Treat" Party! Wear your best costume (or don't) and dress up your car for trunk or treat fun. There will be pizza (regular and gluten free! ), games, crafts, a bouncy house, a visit from police and fire trucks, a costume contest, candy, and much more. The event is free, but R.s.v.p.s are requested to get a head count for pizza and gluten free pizza. Special Populations Halloween Carnival: Come and enjoy games, face painting, crafts, and lots of spooky excitement! The event is sponsored by Chapel Hill Parks and Rec and Orange County Recreation. There will be (non-scary) tricks and fun treats. Cost: $3 for Orange County residents / $5 for non-residents at the door. Registration is requested in advance or you may sign up at the door (the event is listed under Adapted Recreation). Whew! There is definitely a lot going on during these last couple weeks of October. Coming soon: new additions to the CHART Lending Library, including books by Temple Grandin and a copy of Boardmaker!